Rangelands in Oklahoma vary widely in their topography, rainfall, soils and plant communities. Because of these differences, management that is effective in one area often does not have the same outcome in another area. There are two on-line resources that can help in making site-specific management decisions on rangelands: the Web Soil Survey and the Ecological Site Information System. This fact sheet focuses on the content and use of Ecological Site Descriptions that can be helpful for rangeland managers. For more information on the Web Soil Survey please refer to fact sheet NREM-2901. 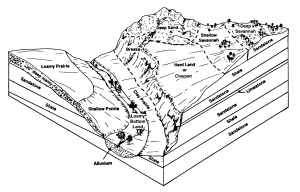 An ecological site is a unique land type with specific soils, climate and topography (Figure 1). Soil-forming factors like geological material, precipitation and location on the landscape impact soil texture, depth, water-holding capacity, salinity and pH, while geographic location determine climate and topography. This distinctive combination of soils, climate and topography controls the sites ability to produce specific amounts and kinds of vegetation and causes it to respond in a predictable manner to natural disturbances, such as drought, or management practices, like fire and grazing. 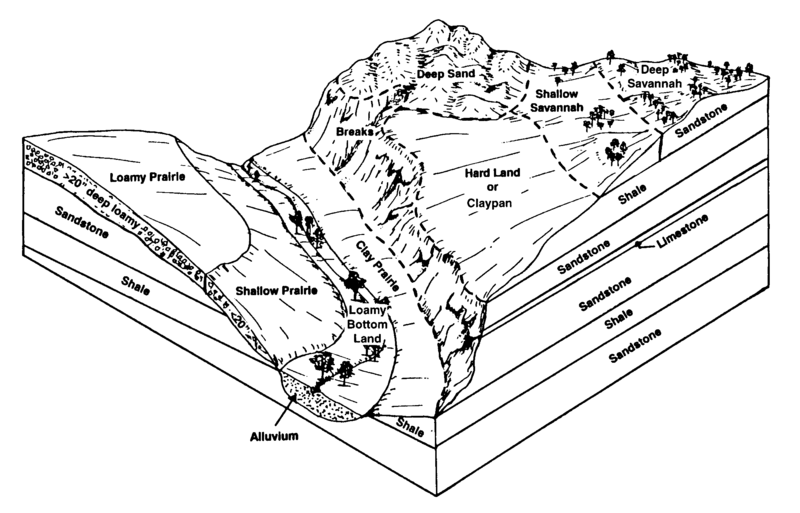 Figure 1: Ecological Sites across a landscape. ESD reports also include information about what the site is best suited for, called the Ecological Site Interpretation. The interpretation includes sections on 1) wildlife and livestock uses, 2) hydrologic functions, 3) recreational uses and 4) other products the site may produce. Using this information, land managers can evaluate the suitability of their land for various purposes, set realistic goals and better predict the outcomes of management practices. 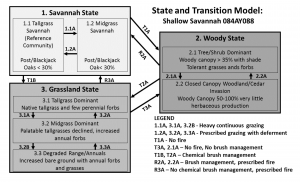 State and Transition Models (Figure 2) are diagrams, included in ESDs, which illustrate what is currently known about how and why plant communities on a specific land type or ecological site may change over time. This important component of ESDs helps to assess the current condition, give insight into the potential alternative vegetative states or conditions in which a site can exist and provide guidance for making management decisions. Figure 2. State and Transition Model for an ecological site in the Cross Timbers of Oklahoma. In the diagram, the outside boxes signify different vegetative states characterized by a particular group of plant species. 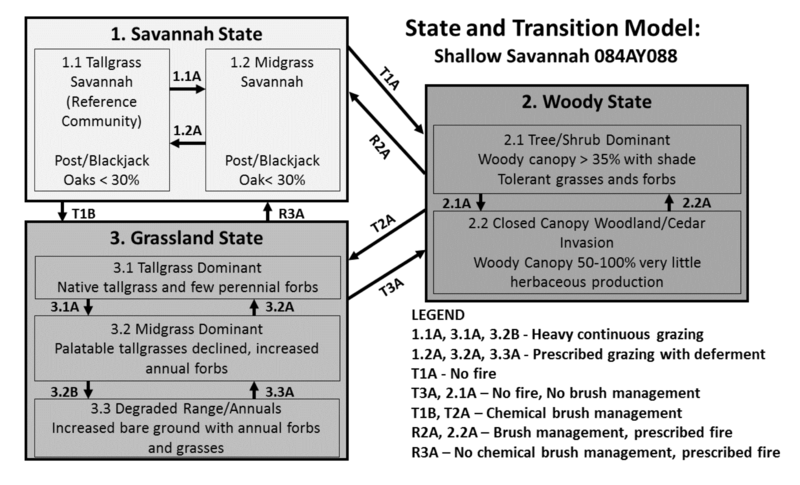 In this example, they are labeled savannah, woody and grassland (Figure 2). The smaller internal boxes contain different stable plant communities within that state. For example, the Savannah state could be either a Tallgrass Savannah or a Midgrass Savannah plant community. Arrows signify actions or events that can move a site from one state or plant community to another. Arrows between two large boxes or states indicate a threshold can be crossed and that management inputs to move back to the previous state will be more significant. These would include practices like re-seeding, brush management and prescribed fire. Shifting within states, or from one plant community to another (internal boxes), requires less intense management practices and can typically be done by a change in stocking rate or timing of grazing. Transitions between states require more significant practices because a shift in states can mean alterations in soil structure, organic matter and modifying how the soil functions and the ecological processes that characterized the site. A narrative section is also provided for each State and Transition Model that describes for several plant communities the typical plant species, history of how it developed and its uses by wildlife and livestock. ESDs provide valuable information for making rangeland management decisions including setting stocking rates, matching animal nutritional needs to plant growth and identifying important livestock and wildlife plant species commonly found on the site. Land managers can adjust stocking rates before overgrazing occurs by using weather data to determine if growing season rainfall for the current year is typical or below the 30-year average, decreasing annual forage production. Although actual clipped and weighed plant production measurements are best, annual plant production values from ESDs can also be used for making initial stocking rate calculations. In addition to matching the quantity of forage to the number of animals, ESDs can also be used to match the quality of forage with periods of peak nutritional requirement in a livestock herd’s production cycle. Using the plant growth curve to identify when plants are actively growing and at their highest quality, managers can synchronize with peak lactation or other times with high nutritional needs to reduce supplemental feed; typically the largest expense for cattle grazing. Another valuable resource is the plant species lists with links to the USDA Plant Database, which provides images and identifying characteristics for each plant. The Plant Preference by Animal Kind table is also a useful tool as it categorizes common plant species as preferred, desirable, undesirable and toxic for several livestock and wildlife species. Finally, the most important management tool in ESDs, the State and Transition Model, informs a manager of the current condition and potential stable states and plant communities their land can be managed for and how to prevent or achieve a transition from one state to another. ESDs are a powerful tool for management, but be sure to verify that the ESD identified for your site is correct. There are three site characteristics that need to match the ESD to make sure it is the correct report for your location. Look at the physical characteristics. Is the topography, elevation and slope similar to those stated in the ESD? Examine the soils. Is the soil texture and depth stated in the ESD what is found on your site? If these match, the last characteristic is to examine the plant community. Does the list of plant species in one of the plant communities match the plants found on your site? If so, you have the correct ESD and have found the state and plant community for your site. If not, review an ESD for one of the other common soils found on your property. Instructions on how to access ESDs are provided in the Ecological Site Description Quick Guide below or copies may be obtained at your local USDA Natural Resource Conservation Service (NRCS) office. The NRCS is currently developing ESDs for every ecological site in the U.S. Many of the eastern states are just beginning to develop ESDs, while the western and central states are more complete. In Oklahoma, ESDs are available for the western and central part of the state with the eastern portion still in development. 1. Identifying the Ecological Site ID number from the Web Soil Survey at http://websoilsurvey.sc.egov.usda.gov/App/HomePage.htm. For more information, refer to the fact sheet NREM-2901. 3. Select the state from the drop down list. 4. Select the MLRA (Major Land Resource Area) from the drop down list using the second – fifth characters from the site ID number. Then click submit. Example: If site ID number is R080AY014OK the MLRA is 080A. 5. Select the specific site ID number as determined from web soil survey. 6. Select “ESD regular report” and then click “continue”. 7. From the options on the left, select “Complete Report”. 8. To print, select “HTML Printable format” from the options on the left.